BMW's manual transmission is slowly coming to an end, as the company decided to exclude manual transmissions for the next generation M5 and M6 models. BMW says that limited interest from consumers is forcing it to drop the manual transmission option in its next generation M5 and M6 to focus instead on dual-clutch gearboxes. 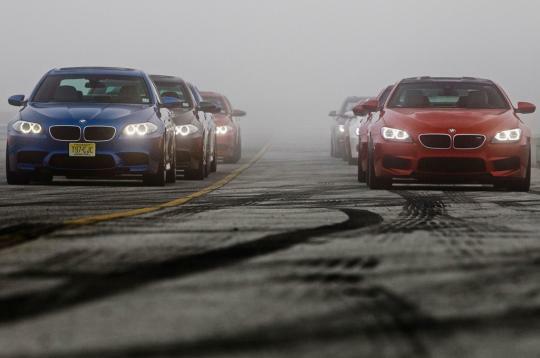 Head of BMW's M division, Frank van Meel, said that "demand has dropped to zero" for M5s and M6s with stick shifts. BMW has previously said that it developed the current manual transmission M5 and M6 specifically for the United States, but even here there has been less demand from consumers than the automaker expected. Van Meel's statement serves as the best confirmation yet about what some of BMW's engineers have said over the last few years. BMW has been slowly phasing out manual transmissions in its American market models. A few years ago, the automaker made the transmissions a "no cost" option over an automatic, rather than making buyers pay extra for a transmission that shifts itself. Today, the M5 and M6 are the only 5- and 6-Series models available with a manual transmission. But fret not, the smaller M2, M3, and M4 will still come in manual. No big loss IMO. The F10 M5 is a boat. A very fast and powerful boat to be sure, but a boat nonetheless. A manual transmission is more suited for smaller, nimbler cars. Out of their lives up, frankly, only the M2 and below would really benefit from it. Not very fast in a straight line but so tossable and fun. A manual transmission is more suited for smaller, nimbler cars. Out of their line up, frankly, only the M2 and below would really benefit from it. Not very fast in a straight line but so tossable and fun. Corrected typo: Out of their line* up. I agree with @turboflat4, no loss, i dont think the M5 and M6 drivers find this an issue, its the drop in demand that led to this decision anyways.